Click the button below to add the SS-MPPT-15L SunSaver 15 Amp 12/24 VDC MPPT Solar Controller to your wish list. 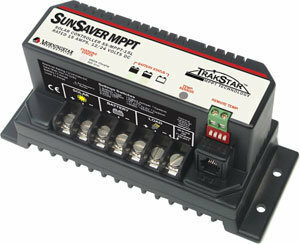 Morningstar is pleased to announce its latest product release, the SunSaver MPPT solar controller with TrakStar Technology™. The SunSaver MPPT is an advanced maximum power point tracking (MPPT) battery charger for off-grid photovoltaic (PV) systems up to 400 watts. The controller (15 amps at 12/24 volts) features a smart tracking algorithm that maximizes the energy harvest from the PV. This product also provides load control to prevent over discharge of the battery. The SunSaver MPPT enables the use of high voltage and thin film modules for off-grid PV battery charging. In addition, the controller provides a means to use up to a 36V array to charge a 24V or 12V battery. This product is well suited for both professional and consumer PV applications. Its charging process has been optimized for long battery life and improved system performance. The SunSaver MPPT is epoxy encapsulated for environmental protection and may be adjusted via on-board switches or PC connection.